Speech-language pathology is the treatment for the improvement or cure of communication disorders, including speech, language, and swallowing disorders. The term used to describe professionals in this discipline is speech and language pathologist (SLP). The discipline of speech-language pathology includes professionals that are trained in the techniques, strategies, and interventions designed to improve or correct communication disorders. Communication disorders include disorders of speech, language, and swallowing. In 2000, there were nearly 88,000 speech-language pathologists in the United States certified by the American Speech-Language-Hearing Association (ASHA), and an additional 13,000 audiologists, who often work with speech pathologists to diagnose disorders. Speech disorders treated by speech-language pathologists include voice disorders (abnormalities in pitch, volume, vocal quality, or resonance or duration of sounds), articulation disorders (problems producing speech sounds), and fluency disorders (impairment in speech fluency, such as stuttering ). Language disorders include developmental or acquired conditions that lead to difficulties in understanding or producing language. Speech-language pathologists participate in the screening, assessment, and treatment of patients who experience one or a combination of these disorders. 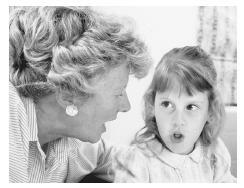 A young girl repeats sounds after the speech pathologist. Persons with isolated speech sound disorders are often helped by articulation therapy, in which they practice repeating specific sounds, words, phrases, and sentences. For individuals experiencing voice disorders, a combination of medical and behavioral treatments are often helpful. For stuttering and other fluency disorders, treatment approaches usually help individuals develop techniques to both reduce the severity of stuttering and allow the individual to produce more fluent speech. For all of these therapies, individuals are taught to cope more effectively with their speech in progressively difficult situations, starting with speaking alone to the pathologist and ending with speaking to a group of people. In treating children with developmental language disorders, treatment often focusses on modeling and stimulation of correct productions of language. This type of approach may also be useful for adults with language disorders, secondary to a stroke or degenerative neurological disorder. For people with severe communication disorders, those due to either a speech or language problem, speech pathologists can assist with alternate means of communication, such as manual signing and computer-synthesized speech. Finally, speech-language pathologists have become increasingly involved with the assessment and treatment of individuals with swallowing disorders, or dysphagia. The majority of speech-language pathologists work in public schools. They are also found at both residential health care facilities and outpatient clinics that specialize in communication disorders. Finally, speech-language pathologists are often employed at hospitals and universities. Professional training programs in speech-language pathology are offered at both the undergraduate and graduate levels. Undergraduate training may include classes in biology, anatomy, psychology, linguistics, education, and special education. Graduate training, at both the masters and doctoral level, provides much deeper opportunities to study communication disorders and their treatment. To receive the Certificate of Clinical Competence (CCC) in speech-language pathology, individuals must hold a master's degree in communications sciences and disorders from a program accredited by the ASHA and complete their Clinical Fellowship Year (CFY). American Academy of Private Practice in Speech-Language Pathology and Audiology. 7349 Topanga Canyon Boulevard, Canoga Park, CA 91303. American Speech-Language-Hearing Association. 10801 Rockville Pike, Rockville, MD 20785. National Black Association for Speech, Language and Hearing. 3542 Gentry Ridge Court, Silver Spring, MD20904.